With SQL 2012 comes a slew of enhancements on the Programmability side. This session will explore some of those new features such as Analytic Functions, Over Clause (Window Functions), Date Functions, Conversion Functions, Sequence Objects, Paging and FileTables to name just a few. If you want to get a jump on those features you will be seeing in SQL 2012 this is the session for you. Getting in the zone is harder to do these days with the infinite sources of distractions that are readily available. In this talk, I’ll give you the frameworks, tools and actionable tips to help you become more efficient, both in work and play. I will draw on my experiences as a family man, college student, developer, business owner, employee and manager using techniques I’ve learned reading countless books and articles in the area of “Productivity”. The end goal is for you to have the focused time needed to do the things that you are passionate about, whether that be writing awesome software or spending more time with friends and family. Keeping your email out of the spam folder is tougher than you might think. Over 20% of legitimate email never makes it to the inbox. Customers quickly become frustrated when they don’t receive important messages like password resets, online purchase receipts, shipping notifications and registration confirmations. Drawing from his experience at SendGrid, which has delivered over 43 billion emails on behalf of over 40,000 customers, Elmer will teach you the factors that determine whether your email will hit the inbox and the practical steps you can take today to avoid the SPAM folder and ensure that your customers receive the communications they expect. Do you love ASP.NET MVC? Are you interested in leveraging its powerful features within SharePoint 2010? Want to know how to improve the readability and testability of your SharePoint applications using the MVP design pattern? This session will introduce you to a new development framework that brings the advantages of Model-View-Presenter design pattern and the strengths of ASP.NET MVC to SharePoint 2010. Brought to you by Slalom Consulting, you will learn about how easy it is to use this tool to help you save time and effort building great applications on the SharePoint platform. Come and see why this framework is sure to turn you into an MVP! Learn how to use CLR Integration, Triggers, SQL Server Functions, and Error Handling. In this session you will see T-SQL code that will help you with your daily tasks. Microsoft SQL Server failover clustering is built on top of Microsoft Windows clustering and is designed to protect against hardware failure. In this session you will learn the basics on setting up a SQL Server cluster. You will also learn how to design windows clustering and design SQL Server 2008 failover cluster instance. If your application relies on simple string comparison to search through text-based data, you might want to learn about an alternative approach. In this session, I will talk about terms such as inverted index, term frequency, document frequency, proximity and more. I will introduce you to Apache Lucene, discuss what it does, and show you how to use it to build your own search feature. Scrum is the most used agile framework for managing software development. Can Scrum help you deliver successful projects? You first have to understand the fundamentals of Scrum. This recently refreshed session will pragmatically explore using Scrum. We'll talk about what how to get started adopting Scrum, what kinds of organizational commitments are needed and how to scale Scrum for very large projects. Scrum is incredibly simple on the surface but touches profoundly on people, process and technology. What should you expect if you do it right, and what if you don't? Join our discussion and tune-up your Scrum knowledge. It all starts with understanding the Scrum Fundamentals. This will be a demo-filled session on how to build self-service Business Intelligence solutions using SQL Server 2012 PowerPivot for Excel and SQL Server 2012 Analysis Services in Tabular mode. The session is meant to highlight the power of the xVelocity (Vertipaq) engine, as well as how easily and quickly Excel pros and Database pros alike can build OLAP solutions to analyze business data and expose the patterns in the matrix. During this session, we'll quickly walk through building a full solution, soup to nuts. We'll cover navigating the PowerPivot environment, importing and integrating data from heterogenous sources, defining relationships and building a semantic model, developing calculations in DAX and delivering your model to users. We'll also walk through the process of migrating a PowerPivot solution into an AS Tabular cube with security roles, partitioning and automated refresh cycles. In this session we will look at what is involved in moving your web application to a farm end to end. Everything from load balancing decisions, how to efficiently and reliably deploy your application and server settings to the farm, how to handle session state in a farm environment, and the tips and tricks you need to know to work with a web farm environment. OpenGL ES 2.0 is provided for the latest versions of iOS and Android. In this session, we will look at the basics on getting started with OpenGL ES 2.0 on both platforms. We will also cover some of the differences in OpenGL ES 1.1 (fixed function pipeline) vs OpenGL ES 2.0 (programmable pipeline). This session will cover what is refactoring, when and when not to refactor, the types (10 important ones) to choose from, and how to perform them correctly. This session uses Agile Data approaches to perform changes to databases, their schema, and their code, in a disciplined way, to restructure those objects. We will cover Database Refactoring strategies, Structural Refactorings, Data Quality Refactorings, and Architectual refactoring. Over all these we will put SQL Unit tests into place to verify our results. We will go over 10 very important and common ones that are often problematic to apply in live settings. •Do you know where your code should go? Are your classes too large? •Do the elements work together? •When should large classes should be broken apart into smaller classes? •When should methods should be moved to another class? •When are methods envying other classes? •How to detect all of these? •What should we do about them? .NET Cyclomatic Complexity - What is it, and how do we reduce it? What are some other code metrics? Why is it important to reduce complexity for developers? Why is it important to reduce complexity for businesses? The target audience for your code is you and other developers. Making your code more readable should be a goal of every developer. This session will cover how to make your code more readable, using Fluent classes/methods in C# and Extension methods. This presentation will provide a good overview of what unit testing is, and how it applies to SQL. We will go over some of the SQL Unit testing frameworks, and dive a bit deeper into the "Data Dude" or Visual Studio Database Unit Testing. A lot of work has been done of the the years with Test Driven Development. With new test runners on the market for SQL, we can now start to bring TDD into SQL. In this session will be using SQL Server Management Studio, to take a ball-park swing at SQL TDD. Did you know what you can use T-SQL in your everyday life? This session will be an uncensored bit a fun to show you how. Isn't Code Camp fun? Slightly different session than the Tropo one...now we will use Twilio! The original phone application is alive and well, and in the cloud! In this session, you will learn when and where to use voice and touch tone applications, the types of applications that can be built, and you will learn how to do this using C# and Twilio. How to make a stateless and stateful application. The original phone application is alive and well, and in the cloud! In this session, you will learn when and where to use voice and touch tone applications, the types of applications that can be built, and you will learn how to do this using C# and Tropo. Starting with EF 4.1 rather than using an entity data model file (edmx), you can code your business objects, and a model will be generated in memory. This concept called code first can make it easier to start with the business objects you want rather than having them dictated by the database. We will examine the intricacies of developing models in this style as well as the concept of migrations which allow the updating of a database over time. This talk gives the history of how delegates have changed in .NET and how they have changed .NET itself. The talk is meant for beginners but even .NET experts can learn something about delegates, events, anonymous methods, closure, lambda expressions, and expressions in general. We will look at how delegates can be used to reduce code duplication, and to centralizing the logic for accessing other systems into a single place called Aspect Oriented Programming (AOP). PHP is fun and easy to program with and it’s easily downloadable off of the web for free. This class provides a simple introduction to PHP, and MySQL. Some basic knowledge of PHP, HTML, and MySQL is suggested but not required. The session will provide an introduction on how to write PHP scripts. Next, a quick introduction to MySQL will be covered including an explanation of the SQL commands which will used to query, and update the database for this specific example. Finally we will tie it all together by creating a menu driven system using HTML, and PHP scripts to add, update, and delete records from the MySQL database. I will talk about software tools that improve my development process (like R#, slickrun, beyond compare,etc..) I will also cover personal workflow habits and tips on improving your workflow and moving more of your "life" to the cloud. I will talk about syncing your life to all machines. This includes notes, email, calendar, files etc.. Some of the products I will talke about are. OneNote, SlickRun, R#, Windows HomeServer, Live Mesh, Google Chrome Sync etc.. This talk will be an overview on the major cloud providers out and what they provide. We will discuss which provider is appropriate for which scenarios. We will disccus why "the cloud" is interesting and why you should be migrating now. We will explain why the overhead assocaited with hosting and running your own sites isn't worth it. I will describe several companies who have converted to a fully cloud based infrastructure and how they are benfiting from it. there are recruiters seeking you out, with offers of new and possibly better employment opportunities. In this session we are going to talk about what to do when the recruiter calls you, including how to evaluate new opportunities, interview, negotiate your salary and how to gracefully exit your present job. Bring your questions – this will be an interactive session. Azure: What's new in the Windows Azure Platform? The Windows Azure platform represents a tremendous investment by Microsoft. Those investments have led to a rich cloud platform, and a regular cadence of new capabilities being released. This demo-heavy session will walk through the newest capabilities. Windows Azure enables solutions that previously would have been impossible or prohibitively expensive to create, and the newest capabilities extend the reach and possibilities of the platform. In this session, you will learn how you can leverage those new capabilities. You will learn why naming is really difficult if done right, why coding and style guidelines are crucial, code structuring, exception handling and why other elements of coding often define the tipping point between success and failure of projects. Following the principles of software craftsmanship will allow you to end up with better maintainability and extensibility of your software and the success of the project in the end. All 3 Clean Code presentations provide great value by themselves, but taken together are designed to offer a holistic approach to successful software creation. Over the lifetime of a product, maintaining the product is actually one - if not the most - expensive area(s) of the overall product costs. Writing clean code can significantly lower these costs. However, writing clean code also makes you more efficient during the initial development time and results in more stable code. You will be presented design patterns and best practices which will make you write better and more easily maintainable code, seeing code in a holistic way. You will learn how to apply them by using an existing implementation as the starting point of the presentation. Finally, patterns & practices benefits are explained. This presentation is based on C# and Visual Studio 2010. However, the demonstrated patterns and practice can be applied to every other programming language too. All 3 Clean Code presentations provide great value by themselves, but taken together are designed to offer a holistic approach to successful software creation. This presentation requires you to know and understand basics like DRY, SoC, SRP, SOLID etc. which will be explained in the 1st Clean Code session. However, it will start at the basics of DI and will work towards intermediate and advanced scenarios depending on the participating group. All 3 Clean Code presentations provide great value by themselves, but taken together are designed to offer a holistic approach to successful software creation. This first session creates the foundation for the 2nd Clean Code presentation on Dependency Injection, as it explains expected base knowledge. Node.js has attracted lots of attention. If you have lots of existing investment in .net technology, you have a choice. You can develop applications that require persistent, long-running connections right inside ASP.NET using SignalR, an open source framework developed by members of the ASP.NET team. This technology can be used scenarios such as chat-like interactivity and progress notifications. In this presentation, I will introduce the main features of SignalR application framework. Unit tests are extremely useful tools for creating reliable, robust software. In this session you will learn the basics of how to integrate them into your existing and future projects. You will be given tips on how to write effective unit tests irrespective of your unit testing methodology. Finally, we will discuss some of the real world issues associated with creating and maintaining unit tests. In this session, we'll cover the main skills needed to build web parts. We'll start with a custom web part (all code), roll into visual web parts (using user controls), take a look at how to allow the users to customize the web parts through properties, and then finish it out by giving our web parts a custom editor. There's more to concurrency than fork and pthreads. The focus is on the tools in a programmer's toolkit ranging from when to use fork/threads/pthreads, various means of synchonization, and their performance tradeoffs from the Architecture, Operating System, and Language perspectives. In this session, I'll will show you how easy it is to create XNA Games for Windows Phone! If you've wanted to build a game, but thought "I can't do that, I don't know anything about writing games! ", we'll help you get over that hurdle and jumpstart your game development! In this session, you will learn how the ALM features of Visual Studio 11 allow your development team to more effectively plan and track work by using the new Web-based project management tools; how to bridge the divide between development and operations by utilizing IntelliTrace in your production environments; and how to help keep team members on-task with the new “My Work” and code review features. You will see these features in action by walking through a day in the life of a development team from interpreting requirements, creating Test Cases, practicing Test Driven Development and creating an automated build. Key feature and usage comparison between the 2 engines - compare and contrast style. This session will arm you with the essential information you need to choose which implementation will work for you! Web developers who know their stuff can now use their powers to create incredible applications for the new operating system from Microsoft - Windows 8. This session demonstrates how to take existing knowledge and utilize it to build cool apps. No web sites made here - just pure app magic. After the web and the mobile revolutions now comes the TV revolution. In this session you will learn about the different platforms already available today (GoogleTV, Samsung TV, Panasonic etc) the different APIs available (NDS SDP, DirecTV Shef etc) and understand the different technologies availble. In addition you will learn the basics of Video transmission and the difference between the cable, Satellite and Internet (over the top) technologies. You can use Windows Azure Blob Storage even if you are not running applications in Azure. You can host html web pages, content, customer files, application deployments (such as ClickOnce), etc. Robin will show the basics of accessing blob storage through the storage client library APIs -- uploading blobs, downloading blobs, iterating through directories to see the blobs listed, what assemblies you need to add to your application, etc. All of these APIs can be called with REST as well. Development platforms are constantly evolving and can be hard to keep up with. Dan has developed techniques for quickly understanding new languages and frameworks; he will demonstrate some of his favorite methods, including how to leverage your existing knowledge and how to use sandboxing to isolate the concept that you want to learn. Some applications are easier than others to migrate to the cloud. In this session, Windows Azure MVP David Pallmann will show you the low-hanging fruit: recipies for application and data migration that are ridiculously fast and easy with a high ROI. We'll perform a number of actual migrations live in the session. If you're looking for no-brainer use of the cloud that doesn't involve a lot of rocket science, this session is for you. Gamification is the practice of adding fun, competitive, and social elements to software applications. It makes the experience more compelling which leads to increased user loyalty and higher productivity. In this session, we'll look at several different kinds of gamification including badges, points, achievements, rewards, contests, leaderboards, auctions, entertaining UI, and "games" that actually solve real-world problems. We'll see examples of gamification in action in HTML5 web/mobile applications running on the Microsoft web/cloud platform. There are many ways of deploying your ASP.NET web applications, all with their inherent advantages and disadvantages. Here we will discuss some of them, including using installer packages, Visual Studio, NAnt, CruiseControl.NET, MS Deploy, Xcopy/Robocopy, and other alternatives. This will be a high-level discussion on each of the deployment techniques, and should give you a good idea of which method is right for you. Have you encountered programming problems that cause no end of pain? I will share a few of the more interesting/difficult problems from my years of experience, and explain the creative methods I used to solve them. While most of the problems are constructed in C++, the advice applies to multiple languages. Windows Phone market is growing rapidly. This presentation covers items you will run into that you need to be aware of during development as well as tips and tricks for improving your user experience with simple animation techniques. The three pillars of SQL Server BI Stack, namely SSIS, SSAS and SSRS have been enhanced in many ways in 2012. This presentation covers many of these enhancements that are not only relevant to day to day operations but also applicable to immediate time savings during development. "Android, Arduino, and the Headphone Jack"
There are quite a few 3rd party devices that attach to a smartphone's 3.5 mm headphone jack, Square's Credit Card reader, being just one of them. In this session we will reveal the magic behind this cool innovative trick. Come to learn how it was done and how your mobile app too, could take advantage of the headphone jack. Hijacking power and bandwidth from the mobile phone's audio interface. Come to see and learn how mobile app take advantage of a smartphone's headphone jack. We will use "phone to phone" as well as Arduino to Android examples to demonstrate and explain this cool and innovative communication channel, and you may even pick up a couple DSP (Digital Signal Processing) basics along the way. This talk covers recent additions to Azure Service Bus, including the use of queues and topics to implement durable pull-model messaging patterns. This talk will serve as an introduction to the Azure Service Bus, focusing on the use of relay messaging to implement a push-model messaging pattern. This is an advanced talk on applying various useful distributed computing patterns in Windows Azure. Among the patterns to be discussed are strategies for exclusive-use and temporary locking, voting algorithms, some retry patterns for data and storage, and utilizing techniques such as Bloom Filters to reduce data access costs. There will be code. The Microsoft Kinect is one of the coolest new controllers for video games. Developers have used the Kinect for everything from video games to controlling robots to interacting with data in clean environments. Come make a simple application with your Kinect, and get started creating your own Minority Report style user interface. Make sure to bring a laptop with VS 2010, or C# Express (http://www.microsoft.com/visualstudio/en-us/products/2010-editions/visual-csharp-express ), if you have a Kinect (http://www.microsoftstore.com/store/msstore/en_US/pd/Kinect-for-Windows/productID.244210600 ) bring that too, if not we will code away, and then share devices at the end. Come see how to leverage your .NET skills to branch out into Windows Azure development. These two talks together will show you how to use all of the features in Windows Azure and discuss when and why you should use each one. In part 2 of this talk, I'll show how to submit an entry to a queue, how to add a worker role in Azure to process the queue, and how to write the information to blob storage. Then we'll change the database access to use Azure Table Storage instead of SQL Azure. Come see how to leverage your .NET skills to branch out into Windows Azure development. These two talks together will show you how to use all of the features in Windows Azure and discuss when and why you should use each one. In part 1 of this talk, I'll show you how to migrate a SQLServer database to SQL Azure, how to create a Azure WCF service that uses the SQL Azure database, and how to hook up diagnostics. I'll also show how to consume the service from a client application. "Using HTML5 to Build Mobile Apps"
Native apps are great, but if you want your app to reach as many people as possible, HTML5 is your ticket. In this session, we'll explore the different ways HTML5 can be used to build and deploy mobile apps, as well as the tools that can make the job easier. If mobile is in your future, and learning Objective-C is not your idea of a good time, don't miss this session! One of the great promises of HTML5 is that you can create software that runs everywhere. In many ways, HTML5 lives-up to this promise, but as with any evolving standard, support across different browsers and devices is inconsistent. To effectively adopt HTML5 today, developers must master the skills that fill-in the gaps and minimize the differences between HTML5 runtimes. In this session, you will learn the essential techniques needed to create HTML5 sites and apps that truly work everywhere. As CSS3 adds support for rich styling in standards-based web applications, style sheet markup can quickly get out of control! Many CSS effects today require repetitive rules to cover the proprietary browser CSS prefixes. LESS for CSS is an open source framework that makes modern CSS more manageable. With support for variables, mix-ins, nested CSS rules, and operations, LESS finally makes complex CSS easy to maintain. In this session, you will discover how LESS can be easily adopted in any project, including ASP.NET, and learn about tools that make it easy to work with LESS on Mac and Windows. Learn the critical basics of developing for Android. If you are a Java developer and have little or no mobile development experience, then this is the session you need to get started developing Android applications. This session is excerpted from the UCI curriculum for Application Development for Android Devices, which is a college credit course offered once per quarter at UC Irvine and taught by the same instructor. There is also an advanced course Advanced Application Development for Android. Both course are part of UCI's Mobile Application Development Certificate. The knowledge presented is the prerequisite for all other SoCal Code Camp Android sessions, including Android Speech Recognition and Text-To-Speech - How to build a voice controlled assistant. "Android 101" is consistently one of the most attended sessions at Code Camp!. Signup early! There is no need to fear Windows Phone. In this session we will cover the basics of Windows Phone 7.5 (Mango) from app design to lifecycle management, navigation, general architecture, and data flow. Everything we will discuss is coming from real world experiences that we at InterKnowlogy have had as we've developed Windows Phone apps. The information of this session is intended for beginners to experts. As Agile Development drastically changed the Waterfall world, the Lean Startup concepts will drastically change Agile Development, mainly for enterprises. Eric Ries is brilliantly teaching us how to deal with uncertainty in the business world. It is about time to take advantage of these techniques and learn how to apply them in the whole software development process. User Driven Development is Agile Development revised to incorporate the Lean Startups principles. How do we know which features users will use and which will not? User Driven Development is a methodology that helps answer this question early on in the development process. The presentation consists of an introduction to the Lean Startup principles and how to apply their best practices in other software environments beyond startups. After decades of work for both enterprise companies and startups, and deeply using Agile Development, the presenter was able to draw an analogy between the new and revolutionary Lean Startup concept from Eric Ries with the actual Agile Development process. The main Lean Startup practices, like Minimum Viable Product and Build-Measure-Learn loop. How to apply the Lean Startup principles to an enterprise software with Agile Development. The disadvantages of the Product Backlog and the Upfront Planning. How to define, plan and prioritize tasks based on the user experience and usage metrics. How to improve a Stand-up meeting. - What are the most important innovations in Windows 8 that every developer should know about? - What is the WinRT about? - What does the WinRT offer to you as a developer? - What kind of developers are mainly addressed in WinRT? - How is it possible that multiple development languages are natively (!) supported? - What does this mean for future of .NET? - Does WinRT herald the death of .NET? Or is it an even more fruitful reincarnation of .NET? - Does WinRT replace Win32? Or is it just another, prettier API on top of Win32? - Does XAML have a place in this new world or was it a one version stand? - Are there any limitations in WinRT or have we reached development Nirvana? Search and Enterprise Content Management - Find your content now! How many of you havew copied contents from File Shares only to find that you can still not find anything just not find it faster? I will show with a few simple steps how to implement automatic tagging or in place tagging so you don’t have to wait for your next migration or force management to use s spreadsheet to identify every document by using Boolean search not just synonyms as part of your Term Set. This session will cover topics such as SharePoint 2010, with Windows 8, and SQL2012 PowerPivot, Visio Services PowerView PerformancePoint , Reporting Services, Excel Services, KPIs, and much more... and receive an 8GB FlashDrive with content. The Model-View-ViewModel (MVVM) pattern is fundamental for those who develop WPF applications. The goal of this presentation is to provide the audience with a clear understanding of MVVM fundamentals, objectives, and it’s application. A WPF application will be used to demonstrate the practical application of the pattern. If you've been putting off thinking about multi-threading, now is the time. It's rare to find a machine without multiple cores anymore and even on single core systems leaving your whole app on one thread can try your users' patience. There are now many ways .NET can help you out to better take advantage of threading to make your code run faster and be more responsive. In this session we'll look at the basics of the new async/await keywords, Reactive Extensions, and the Task Parallel Library and how to know what to use when. So many Microsoft platforms now have support for some type of XAML programming model that it seems like XAML is everywhere. If you have existing XAML applications you may be thinking about taking advantage of this commonality to start sharing code across platforms. Unfortunately, there have been a lot of stumbling blocks to doing this, including incompatibility of compiled assemblies and changes to available framework features or naming that can be hard to discover without a lot of trial and error. Portable libraries can help solve some of these problems, and are now built into Visual Studio 11 with support for WPF, Silverlight (in and out of browser), Windows Phone 7, Windows 8 Metro, and even Xbox 360. We'll look at what you can share, what you can't, and how to best structure your code for maximum reuse. Stop writing crappy code! AOP is a programming methodology with focus on handling cross cutting concerns. However, this session exposes the true power of AOP for solving real problems far beyond logging. In this session we'll learn about the differences between runtime and compile time frameworks, how to get up and running quickly with AOP and solve some real world problems with AOP. Courage vs. Conformity: Do you have what it takes to start you own company? Are you coachable/teachable? Do you believe in yourself or are you easily discouraged? Got an itch to make a move? Dont know if now is the right time to take that leap of faith? Join us for an interactive session. LONGEVITY / Staying Power: At your current salary, when can you afford to retire? It's not how much you make, but how much you keep. Reflection is incredibly powerful and critically important to .NET. In this code-intensive session, you will learn about reflection and will leave with simple strategies for using it and making it maintainable. We will determine objects' types at runtime, construct classes dynamically (even with parameters), invoke class methods, build a Factory Method, and synchronize data across different classes. This is a high-quality Bearman & Halperin presentation. Have you ever not gotten a job due to not being prepared for the technical interview? I've have interviewed 100's of software developers and will share my knowledge on how to survive, what we look for and even divulge some of the secrets we use during the process. This session will include advice from hiring managers and even recruiters! Revamped for 2012, this session will guide any level of programmer to greater productivity by providing the information needed to write consistent, maintainable code. Learn about project setup, assembly layout, code style, defensive programming and much, much more. Code tips are included to help you write better, error free applications. Lots of code examples in C# and VB.NET. This session is based off my latest book, David McCarter's .NET Coding Standards. What do programmers really want? Do you work at a great or bad company? Are you frustrated with your job? Are you stressed out to the point your head wants to explode? What can be done about this and more subjects? Attend this session and find out the answers from your fellow geeks. This will be a highly collaborative session and you are guaranteed to learn a lot! No longer do developers have a free lunch when it comes to performance. Poorly performing code can't be fixed by upgrading the processor. The number of Ghz has stopped climbing but the number of cores has just started. But how do we take advantage of multiple cores without destroying the readability and maintainability of our code? Multi-threading is complex, isn't guaranteed and is dependent on the OS. Because of the complexity in multi-core programming, Microsoft has given us the Task Parallel Library. The TPL was designed to make it much easier to write managed code that can automatically use multiple processors. But the TPL can only do so much for us. We must think about and design for parallelism. In this session we'll cover the TPL, PLINQ and how to design your code for parallelism. Learn about building composable and extensible systems using Microsoft Extensibility Framework. In this session we'll build an app from scratch using Groovy and Grails, then deploy it to the cloud on Heroku. You'll even get a quick look at git! The Quick Web Application Builder (QWAB) generates complete functional web-based applications through a web-based interface in three easy steps. The generated applications are in PHP with supported databases: MySQL, Oracle and PostgreSQL, among many. Small and large-scale applications are equally supported and the object oriented code can easily be customized to fit any need. QWAB was started in 2006 by Jorge Garifuna and it has been used successfully in production systems ranging from Advertising companies to Jewelry manufacturing companies to Government systems. QWAB continues to evolve with cutting edge technologies such as Boostrap from Twitter, the HTML5 framework that is rapidly gaining massive adoption. Whether the project interacts with one or hundreds of database tables, QWAB builds a complete Web Application in 3 easy steps. For cases where rapid development is desired, QWAB provides standard PHP/MySQL CRUD in generic and Bootstrap (from Twitter) format in 2 steps, through its Web-GUI guided approach. Beginners and expert developers will equally benefit from having QWAB in their Development toolbox. • How to get started with QWAB. • How to build your first complete functional Web Application in minutes through QWAB’s 3 step guided process. • How to generate standard CRUD from QWAB in 2 steps.• How to generate CRUD for Boostrap from Twitter in 2 steps. • How to customize the Object Oriented code generated by QWAB. Jorge Garifuna is a Professional Software Developer and Consultant with over 15 years of industry experience. His portfolio of technologies include but are not limited to various programming languages, Web 2.0, a diverse number of Frameworks, countless of databases and the latest and greatest in Mobile for popular platforms such as IOS, Android and BlackBerry, among many. Over the years, Jorge has successfully Designed, Developed and Deployed Software in the areas of E-Commerce, Project Management, Content Management Systems (CMS), Enterprise Resource Planning (ERP) and Customer Relationship Management (CRM) to name a few. His technologies have been used, by many consumers, employees and businesses, some of which have grown to multi-million dollar businesses. Jorge prides himself as a happy contributor to various Open Source Projects, including the ATK Framework and vTiger CRM to name a few. He has also given various presentations in the topics of: Joomla CMS; ATK Framework; Wordpress; ELGG Social Network Framework; Integration of Linux, Apache, MySQL, SQLite with Mkahawa Cyber Manager and PHP; and Mobile Development for Web, IOS Native and Android Native. We all know that Mobile Development is the big talk of the moment, but getting started brings more questions than answers. Questions such as: Where do you start? What platforms do you target? and/or Do you have to learn COCOA, JAVA, HTML5, CSS3 and all those technologies that you may not know much about? How to design and build a single application that runs perfectly on: mobile web browsers, iPhone (native app), iPad(native app) and Android(native app). As websites become more interactive, the demand for real-time updates increases. Learn why node.js is a good fit for the real-time web and how easy it is to get started with it. What is node.js and what problems does it solve? Build a WordPress Blog and Photo Gallery Site in 60 Minutes! performance checks in both your server-side and client-side code. Security is important, and SQL injection is often discussed in security talks. In this session, I'll walk through more than just how SQL injection works; I'll show you how it interacts with the ViewState and what that means for the design of your jQuery, Ajax, and CodeBehind in an ASP.NET app. You've got a great team, a great idea and 90 days to make as much progress as possible, what do you do? Join Justin McCammon as he recounts the tall tales and short deadlines that made up his experience as co-founder and CTO of iOS app GonnaBe as it went through the 90 day Start Engine accelerator in Los Angeles. Every day, we work with customers to help them improve existing applications developed in .NET. In this session, you will learn 15 of the most common problems we see all the time in custom business applications, including issues such as weak security, inline constants, over-use of the DataSetclass, lengthy or monolithic code, absence of configuration settings, poor type conversions and more. You will come away with the best practices you should be using to make your business applications performant, reusable, testable and secure. Collections are fundamental to managing and binding data in a variety of scenarios across almost all user interface technologies available today. In this session, you will learn all about the common collection interfaces and classes available in .NET, such as lists, collections, dictionaries, hash tables, queues and stacks. You will learn how and when to use the features provided by the .NET System.Collections and System.Collections.Generic namespaces to build features in your business applications, including use of business object collections, sorting, filtering, lambda usage,and more! Building off of Beginning jQuery, this session will go into some of the more advanced features and methods of jQuery, including Ajax, $.when(), $.done(), $.promise(), advanced techniques for selecting elements in the DOM, and building and using jQuery plugins. Many developers forget about good object-oriented design techniques when developing in SharePoint, most of the time because they get overwhelmed by the framework. Unit testing often gets thrown out of the window, and most of the time the application becomes very tightly coupled to the SharePoint object model. This talk will demonstrate how to overcome these obstacles and build solid SharePoint application code that is much more testable and is easier to maintain. There are some classic database programming tasks that rely on answering the question "What did I just change?". Prior to SQL Server 2005, we had to use tricks for handling multiple rows. You probably had to create some loops, messed with SCOPE_IDENTITY() and it's parallel execution plan problems. Maybe you even had to resort to triggers for the sole purpose of answering that question. Well, it's time to shelve those tricks and get back to saving the day! This session focuses on the practical use cases for the T-SQL OUTPUT clause. You will find out how you can ditch the tricks of the past for a simpler solution that will help keep you sane. Learn what developers need to know about networking (The TCP/IP kind, not the Facebook kind). In today’s world it’s rare to write an application that doesn’t rely on the network, but so few of us know how to troubleshoot networking issues. Stop wondering if it’s your code or the network, I’ll show you how to point the finger at the right culprit. We will follow the life of an HTTP packet as it goes from your web browser to the server and back. Learn how to determine what stopped the mission of that packet and why. Was it name resolution? TCP Port availability issues? Do we need to sniff the packets to find the problem? This session will make you a better programmer regardless of the technology you are using. Learn how to setup, configure, and manage IIS 7 & 8. Microsoft made significant changes in IIS 7. Everything from architecture, setup process, plug-in architecture, security configuration, IIS manager, and much more. We will cover the basics of IIS 7 & 8; New Features, Site Creation and Configuration (like what is a host header? ), how SSL certificates work, and how to better troubleshoot and manage your web application. Developers rely on IIS to run their applications. Come learn all that you need to know about IIS 7/8 and how it can make your life easier. This session demonstrates how to create a List Definition with a corresponding List Instance, and then attach an Event Receiver to the list to perform some tasks like rename and archive. The objective of this session is to learn how to build List Definitions, List Instances, and Event Receivers using Visual Studio 2012 with a discussion on the enhancements built into Visual Studio 2012. This course will explain how to become a Oracle Certified Java Programmer. We will talk about what is on the test, what books are needed, practice tests, how to keep yourself on schedule, where to take the test, and how much the test costs. A solid programming background is crucial Unit Testing as well. Mobile technology is a large market and Java is a part of that as well - Android. Once again you need a solid programming background. Are you a total noob when it comes to CoffeeScript? I am. But I've found that learning CoffeeScript is fun and easy, and I'd like to share my experiences with you getting up and running with CoffeeScript. I'll show you where to find information about CoffeeScript, how to setup node.js on your machine with CoffeeScript support and how to add CoffeeScript support to Visual Studio. Then I'll implement a finite state machine in CoffeeScript right before your eyes, and if we have time, we can whip up a pushdown automaton or a Turing machine. Diagnosing MEF composition failure is tricky, especially when parts have two or more nested dependencies. In this scenario, MEF's error messages aren't very helpful. MEF was unable to satisfy one or more parts in the chain, but the error message points you to the part at the top of the chain, to really fix the problem you need to know about the bottom of the chain. If you start by looking where the error message sends you, you can end up feeling like you're on a wild goose chase because nothing appears to be wrong with that part. Come to this session to discover tools that can ease your frustration with MEF, and get you out of diagnosis mode and back to coding. I'll show you how to combine these tools with ApprovalTests to create integration tests that provide early warning when something is wrong with your parts. Finally, we'll look at MEF 2 and the diagnostic improvements Microsoft has in store for the next version of this useful extensibility library. The Windows Embedded Compact sessions provide information to help you better understand Windows Embedded Compact technologies, opportunities in the embedded market and how you can leverage existing Visual Studio (C++, C# and Visual Basic) skill set to capture opportunities in the embedded marketplace. Windows Embedded Compact 7 is the latest version of Windows Embedded Compact (formerly known as "Windows CE"). Windows Embedded compact was initially introduced to the market in 1996 and has been through continuous development and improvement for more than 15 years. 1. Introduction to Windows Embedded Compact 7. 2. Embedded Application Development with Visual Studio and Compact 7. If you are new to Windows Embedded, it's recommended that you attend both sessions. - "Professional Windows Embedded Compact 7" book. Embedded devices are all around us. We use these devices on a daily basis such as the set-top-box, flat-panel TV, smart-phone, portable GPS navigation device, automotive infotainment, self-service checkout kiosk at the market, self-service gas pump, ticketing machine, ATM machines and the list goes on… Think about the business and development opportunities associated with these embedded devices. Whether you are currently coding in C++, C# or Visual Basic, Windows Embedded technologies and the Visual Studio integrated development environment enables you to develop application for "Embedded" device. - Embedded devices in the "Big Data" environment. - Windows Embedded Compact 7 development environment. - Windows Embedded Compact 7 development tools. - Develop a Compact 7 operating system image for a target device. - Establish connectivity and download the operating system image to the target device. - Develop a Compact 7 Managed code application in C#. - Establish connectivity and download Managed code application to a Compact 7 device. - Debug and Remote tools. - Develop a Silverlight for Windows Embedded application. - Windows Embedded Compact site. Visual Studio LightSwitch in Visual Studio 11, allows you to access your LightSwitch application via OData. This allows you to access the business layer and security of your LightSwitch application. It also allows your LightSwitch application to communicate with web pages, mobile clients (IPad, Android, Windows Phone) and use web technologies such as DataJs, KnockoutJs, and JQuery. Creating a HTML web application that communicates with the LightSwitch business layer. 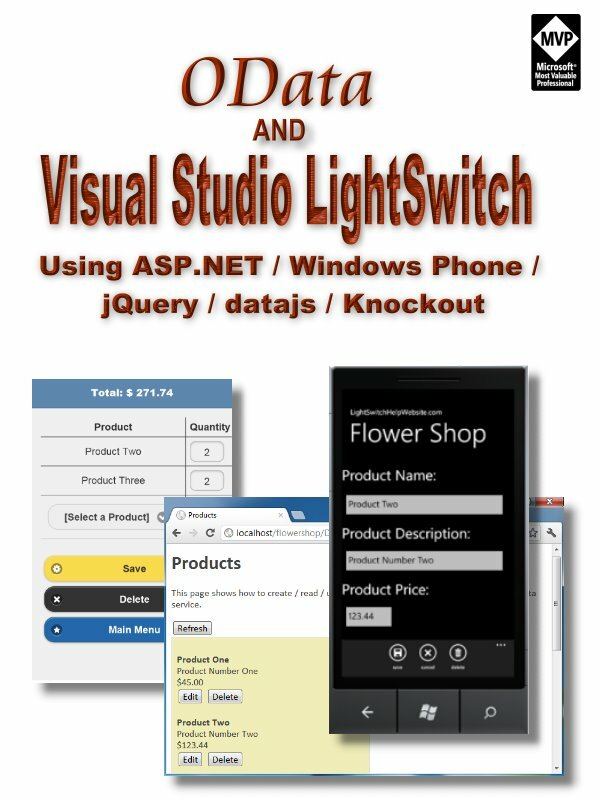 Creating a JQuery Mobile application that communicates with the LightSwitch business layer. Creating a DataJs / KnockoutJs / JQuery application that communicates with the LightSwitch business layer. This session will cover the structure of WordPress Themes, requirements of a WordPress Theme, Custom Pages, Posts, Category Pages, and Plugin Integrations. More info coming soon! "Android Speech Recognition and Text-To-Speech" - How to build a voice controlled assistant. In this session, I’ll demo the tips and tricks of Google SketchUp and show a couple of videos. You’ll learn how to make a start on 3d objects through SketchUp. The first demo will be of how to create a simple house, and then there will be more demos with the complexity increasing as the demos progress. This session will discuss branching and merging with Team Foundation Server and Visual Studio ALM 2010 and 2012 . We'll begin with a quick overview of the TFS source control system, then explore several strategies for managing project source control. With even moderately complex projects it is far too easy to create a tangled ball of confusion by branching without a clear strategy. We'll cover some basic branching structures that can be applied to most of the common scenarios to help untangle you. how using ApprovalTests make testing many types of objects (from simple types to complex objects such as GUIs, arrays, database query results and more) more manageable. The library is available in many programming languages, including C#, Java, Ruby, PHP and more. Most demos will be presented in C#. Join us as we explore ASP.NET MVC and it's capabilities. Learn about the model view controller paradigm and how it's perfectly suited for web applications. We will be discussing the differences between asp.net mvc and asp.net webforms. We'll look at code samples and best practices to get you up to speed and building asp.net mvc websites in no time. In this session we'll take a very detailed look at the ASP.NET MVC model binding mechanism. We'll examine how to model-bind complex collections using the default binder. We'll also build a custom value provider and two custom model binders. This session will teach you how to get the most benefit out of the binding system and how it can be easily extended to fit any situation. This session is aimed at introducing several producitivy features that you can use with asp.net mvc. We’re going to look at the different ways you can create data grids. We’ll start with a simple table, then a webgrid and finally use some third party grid components such at Telerik’s asp.net mvc extensions and kendoui. I’ll show you everything you need to add a powerful grid in asp.net mvc complete with sorting, filtering paging and even ajax. We’ll also look at exporting data to excel, I’ll show you how to generate an excel file from a controller with 1 line of code! Brief introduction to ITIL v3, How ITIL impacts the developer, and How to sell ITIL to your organization. Those are the lessons I learned from transitioning to a more cloud based development culture, the cloud tools, the fear of the monthly Amazon bill, and how to do that as part as a bigger software organiziation. This can be anything youw ant it to be so come with questions. I am thinking about doing it unconference style and more Q&A than PowerPoint. Cassandra is one of those NoSQL databases and was developed by Facebook taking the best of Google's BigTable and Amazon's Dynamo. We will explore the features from the perspective of a developer/architect and learn how to optimize for the platform and how to avoid it's shortfallings. “The single biggest pool of untapped natural resource in this world is human good intentions that never translate into action.” – Cindy Gallop. Unfortunately many people’s good intentions to help to improve your OSS project don’t result in any action because there are many hurdles to them making a meaningful contribution. The list below shows what we have seen to be the steps that potential contributors often go through. Most well-intentioned potential contributors just don’t seem make it to the end of this list. Wish – I wish this OSS did x, y or z. Explore – Let’s see what how this code actually works. Hack – If I change this, this feature should work. Share – This Patch adds my new feature. Acceptance – My patch was accepted! Insight – Because of my patch, they started doing feature a, b or c.
This talk will be a collection of real-world stories of how we have lowered the bar for contributors to our OSS projects. As a result, we’ve collaborated from programmers from the US, Europe, Africa, India and Australia. Our talk will include stories about our successes in side-stepping the typically longer process. It will also cover an examination of the specific hurdles and an explanation of the techniques and practices we have used to harness the good intentions of others. Specifically, we will share real world stories from our own OSS projects (ApprovalTests and TeachingKidsProgramming) where specific problems or needs were addressed and improved or fixed due to contributions of other programmers. We will talk about techniques to make working with contributors world-wide possible. These will include specifics about remote pair programming, use of other OSS tools, and setting up environments, creating videos and other artifacts. Also we will share information about the human side of harnessing volunteer goodwill, including lessons we learned about response time, work time, cultural differences and more. The open source community has grown strong and productive by harnessing the goodwill around the globe. We would like to turn even more of that goodwill into code. A look into the language of code and how it expresses our ideas. This talk looks at many languages (including C#, SmallBasic, Java, Ruby & Haskell) and searches to find ways to make code clearer and more meaningful. Are you afraid of making estimates? You are not alone! Do you know why making quality estimates AND tracking actuals is so important? Can you really estimate how long a football game will be? Learn the importance of accurate estimating and how that skill will help you define and manage your customer’s expectations. Discover the difference between ‘ideal time’ and ‘elapsed time’ and why your estimates need to encompass both. Join others in learning the anatomy of an estimate and lean techniques to make your life easier. Come learn some great tips you can begin using your first day back on the job. Have you wondered…why your applications just don’t seem to match your customer’s expectations? How do you manage the ‘moving target’ of requirements? Learn key, common sense, concepts to provide an improved foundation to your skill set. Today’s economic conditions have helped drive the need for new tools and methods for requirements gathering. Discover approaches to matching requirements and customer’s expectations. Understand the intricacies of balancing scope, schedule and budget. Learn how to balance the need for rigor and the need for speed and efficiency in gathering your requirements. Grasp how to embrace uncertainty that is inherent and inevitable in software development projects. These best practices presented to you will enable you to leverage what you learned at your first day back at the office. CTO Roundtable: "Big Data - Innovation, Competition, and Productivity"
The amount of data in our world has been exploding, and analyzing large data sets—so-called big data—will become a key basis of competition, underpinning new waves of productivity growth, innovation, and consumer surplus. Leaders in every sector will have to grapple with the implications of big data, not just a few data-oriented managers. The increasing volume and detail of information captured by enterprises, the rise of multimedia, social media, and the internet will fuel exponential growth in data for the foreseeable future. In this panel driven event, we will discuss innovation, competition and productivity in harnessing the enormous potential of Big Data. If you are interested in Bluetooth Smart, Low Power Bluetooth, Bluetooth Low Energy - BLE - or Bluetooth 4.0 and building iOS iPhone and iPad or Android Apps to read Bluetooth sensors or create Bluetooth sensor networks check out this upcoming session at SoCal Code Camp in San Diego at UC San Diego on June 23rd and 24th. The differences between the different Bluetooth version. The currently available Bluetooth Smart modules and Development kits, we will have several develpment kits from vendors like Blue Giga, ConnectBlue, Meta Watch, TI and Tod, with us. How to build a simple Android or iOS App to discover, connect to and read from a Bluetooth Smart sensor using an iPhone 4s, iPad3 or Android devices. Connecting to cloud platforms to store, retrieve manage & maintain and share sensor readings & related data and information. There is an upwards trend in multi-channel communications, cloud based, telephony applications build by both startups and larger enterprises that incorporate voice, SMS, IM, and social networks to communicate with their users. So during the SoCal Codecamp on June 23rd & 24th at UC San Diego we will demonstrate how you can quickly and easily add multi-channel communications to your applications to send and receive SMS text messages as well as place and receive VoIP, SIP-based, phone calls using the Voxeo’s Tropo API and Phono. In addition we will touch on using the Phono Mobile SDK and Phonegap to create native communication applications on IOS, Android, WP7 and other Mobile Device platforms. More information on Tropo can be found on the Tropo Website. Check the Phono website for more information on Phono and the Phono Mobile SDK and information on Phonegap can be found on the Phonegap website.